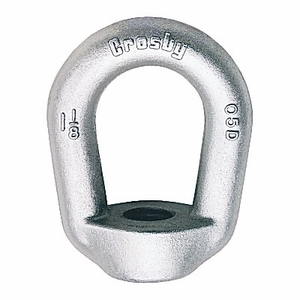 These heavy-duty eye nuts are made from forged steel, Quenched and Tempered. They feature a hot-dip galvanized finish for serious protection against weathering and corrosion. 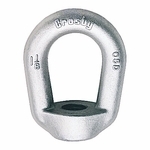 They are tapped with standard UNC class 2 threads (tapped after galvanizing). All eye nuts are intended for in-line pulling only. Inquire about untapped or metric tapped eye nuts as well (special order only). Safety factor of 5:1.